After the death of Jonathan Maccabeus, one of the great Jewish leaders, there was much turmoil within the Jewish government. In this video lesson, Dan Cates gives a history lesson on the rise of the Hasmoneans. 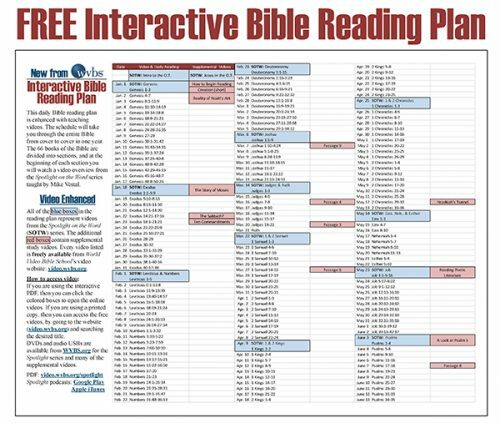 While the Bible doesn't record what happened during the centuries between the end of Malachi and the beginning of Matthew, we are given many predictive prophecies in the Old Testament that were fulfilled during this time. Called the Intertestamental Period, secular history provides many of these events and confirms the Bible's validity. 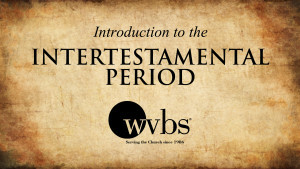 In this first lesson of the Intertestamental Period, Dan Cates gives an historical overview of this time. During the Intertestamental Period, the nation of Israel was divided into two regions: Northern Israel and Southern Judah. In this second video lesson, Dan Cates gives an overview of the history of Israel, their judges and kings, and how the nation came to be divided. The nation of Egypt has been in existence for thousands of years and is mentioned many times in the Bible. In this video lesson, Dan Cates gives an overview of Egypt's history and rulers that will set the stage for better understanding the Intertestamental Period world. One of the great stories we read about in the New Testament is Jesus' meeting with the Samaritan woman at the well. With this act, Jesus violated two Jewish taboos: He had spoken to a woman and more importantly, He had spoken to a Samaritan. Why were the Samaritans so despised by the Jewish people? 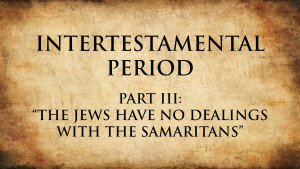 In this lesson, Dan Cates presents seven reasons for the Jews hatred towards the Samaritans. Babylon, mentioned in Daniel chapters 2 and 7, was a dominant world power in the 500-600s B.C. and were used as God's tool to punish the Jewish nation for their disobedience. 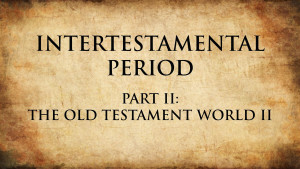 In this video lesson, Dan Cates presents a brief history of the Babylonian nation and where they fit into the scriptures. The Medo-Persian Empire was the kingdom consolidated by Cyrus II, the Great and was the second nation presented in Daniel's vision. Join Dan Cates as he presents a video lesson on the nations of the Medes and the Persians. In this next lesson on the Medo-Persian Empire, Dan Cates begins with the rise of King Cyrus. The lesson continues through the Persian King Xerxes I. The area in and around modern-day Greece is rich with millennia of history. In this lesson, Dan Cates gives an overview of Grecian history up to Alexander the Great. Beginning with Alexander the Great, the Grecian Empire began to grow from mere city-states into a great nation. In this video, lesson Dan Cates gives a historical overview of this mighty nation. Alexander the Great's conquests are some of the most well-known in history, even being prophesied in scripture. Join Dan Cates as he presents a lesson on Alexander the Great and his place in secular and Biblical history. Alexander the Great's many conquests earned him his title as he conquered many lands. However, upon his untimely death, he left no clear successor to his throne causing turmoil and division in these lands. In this lesson, Dan Cates discusses events leading up to and just after Alexander the Great's death. In this video lesson, Dan Cates discusses two of the succeeding lines after the death of Alexander the Great: the Ptolemaic and Seleucid rulers. In this video lesson, Dan Cates discusses the growing power of Rome and the lives of Antiochus III and IV. Daniel prophesied Antiochus IV as being a corrupt and wicked ruler. In this lesson, Dan Cates continues his presentation about Antiochus IV and presents information about the group of Jews known as the Maccabees. He also gives a brief overview about the Apocrypha. After being commanded to offer a profane sacrifice and refusing, the priest Mattathias and other faithful Jews fled from Jerusalem to seek refuge. Among these faithful Jews was one of Mattathias' sons, the great leader Judas Maccabeus. 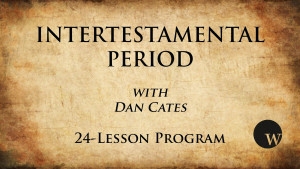 Join Dan Cates in this video lesson as he presents a lesson on the rise of the Maccabees. After the death of Judas Maccabeus, his brother Jonathan was appointed leader of the Maccabees. In this video lesson, Dan Cates focuses on the history of the Maccabees under Jonathan Maccabeus. In this video, lesson Dan Cates presents a lesson about the Hasmonean rulers and the rise and fall of the Hasmonean line. The nation of Rome is one of the great nations prophesied about in Daniel 2 and 7. In this class Dan Cates discusses Rome's early beginnings as a small village near the Tiber River to the period of Hannibal of Carthage's threat to the Roman Empire's future. In this lesson, Dan Cates presents a video lesson about Rome's steady and continued growth as a nation and its entry into Judea in 63 B.C. under the general Cneius Pompeius. 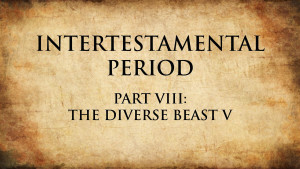 In this lesson, Dan Cates further discusses historical fulfillment of prophecies found in Daniel 7 in regards to Rome and its Caesars. The writings of Tacitus and Suetonius, two important Roman historians, provide many helpful and interesting insights into the Roman people and government during Christ's time. In this video, Dan Cates presents lesson about these mens' writings and the history of the time. In this video lesson, Dan Cates discusses the Roman Caesars leading up to Christ's life and the Caesars that persecuted the church. In this last video lesson, Dan Cates discusses Herod the Great and his sons and the procurators (Pontius Pilate, Felix, and Festus) that ruled during Jesus' time and the early church.